Today was the first day of Chocolate and Cashew Theme Week. 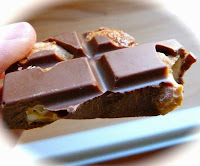 Frankly, it's about time that the cashew nut is being honored with its own theme week here on ChocolateBanquet.com. Almonds seem to hog the spotlight when it comes to nuts blended with chocolate. 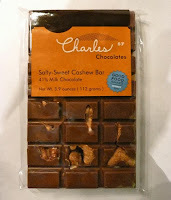 This Salty-Sweet Cashew Bar from Charles Chocolates (San Francisco, CA) highlighted this special nut. 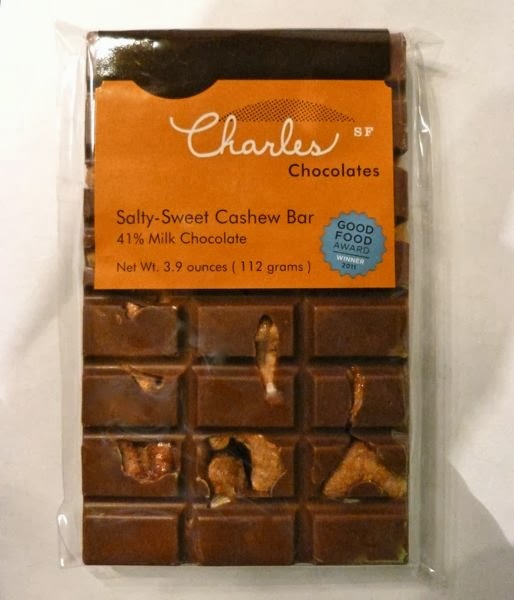 First, rather than incorporate shards of nut (shrapnel bits) into their 41% milk chocolate bar base, chocolatier Chuck (Charles) Siegel used freshly roasted, whole cashew nuts that were coated in both salty and sweet flavors. I found myself wanting more salt after the first few bites of this "salty-sweet" bar. However, when I re-tasted this chocolate later, I could taste more salt, which helped balance the sweetness of the milk chocolate.